Come take a bike ride with us to celebrate the summer and see what’s happening in Eastern Queens! We’ve had a lot of good news in our neighborhood this year. The city will begin repaving Vanderbilt’s Motor Parkway, thanks to the $1,250,000 Barry Grodenchik was able to secure. Due in large part to our volunteers, there will also be 7 miles of new protected bike lanes on Northern Boulevard, East Hampton Boulevard, and Oceania Street that will be built by next spring. 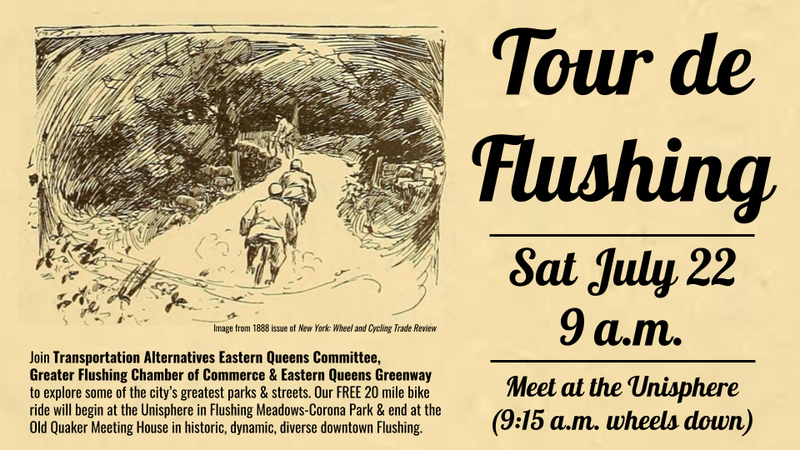 On Saturday, July 22nd at 9:00 AM, we will be doing a “Tour de Flushing” to bring attention to these major accomplishments. The 20-mile bike ride will travel through our historic greenways, parks and streets. We’ll start at the Unisphere and end at the historic Flushing Quaker Meeting House.